Offshore WIND, part of Navingo BV, has released its 2019 business guide for the offshore wind industry. The 8th edition of the Offshore WIND International Business Guide features 70 full company profiles, with 141 companies joining us online. This year’s publication – issued in 3,000 copies – also contains six market outlooks. 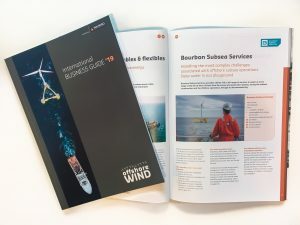 While the companies featured in the guide already got their copies and the subscribers will soon receive theirs with this year’s first Offshore WIND Magazine, the rest of the industry will be able to get their hands on the new edition at events across Europe, as well as those in Asia and the United States. The Offshore WIND International Business Guide, along with its online edition, is dedicated to displaying the offshore wind supply chain companies with all their expertise. The printed edition is only one part of an interconnected, multimedia base, each part with different properties designed to offer the readers a wide range of relevant information. On OffshoreWIND.biz, you can also find video clips, photo galleries and updated information about the companies. Advertising info: The Offshore WIND International Business Guide 2019 has been published and advertising in the printed publication can now only be booked for the next edition (2020). This year’s first edition of the Offshore WIND Magazine will be published in March, with the advertising deadline expiring on 15 February 2019.